You know it's summer when weekly Monday Made It is back! 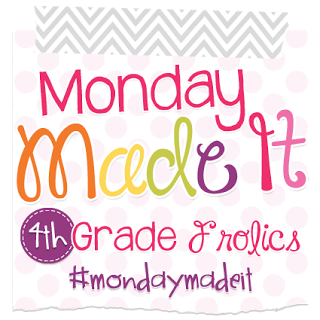 Many thanks to Tara of 4th Grade Frolics for hosting this awesomeness every Monday during the summer. Seriously....this linky is one of my favorite things about summer! 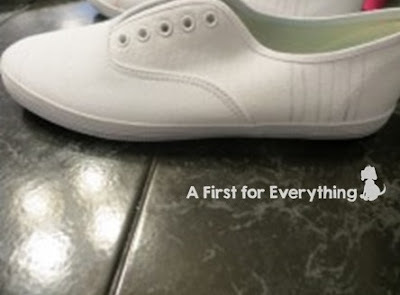 Because who doesn't need a pair of pencil shoes?! 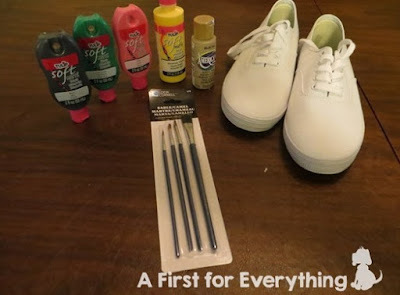 Supplies: Sneakers (I got mine for $6 at Walmart), fabric paints (though you can use acrylic paints too), and paintbrushes. All paints and paintbrushes came to less than $20 with a teacher discount at Jo-Ann's. 1. 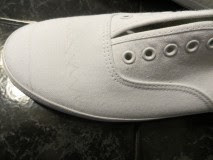 Begin by marking with a pencil where you want your lines to go on the sneakers. I had a picture of a Ticeronda pencil on my phone that I used as a visual guide. Here's a close up of the zig-zags. 2. Using a fine tip paint brush I painted the zig-zag first since I think that is the hardest part. I couldn't find a tan fabric paint color that I liked, so I used a tan acrylic paint. All the paint dried really fast so I did all my painting in one sitting. 3. That's it! The whole project took me less than an hour. That's my kind of craft! I used to have a life on the weekends. Until....my son started playing baseball. It's been great fun though and he's had a great season. 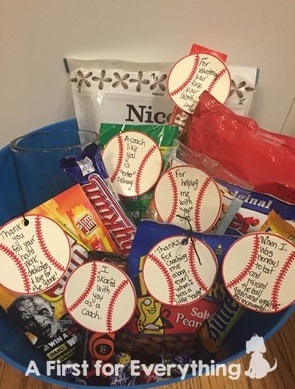 To thank his amazing coaches and inspired by Pinterest, I made a gift basket of various candies/nuts using a baseball theme. I'm sure the coaches TOTALLY appreciated that I dusted off my Sihouette Cameo for this gift. 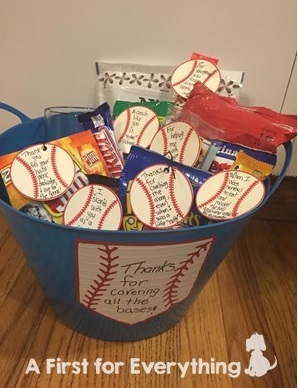 Extra gum- A coach like you is "EXTRA-ordinary"
Butterfinger- "When I was nervous to bat and missed the ball you encouraged me." Skor bar- I "SKOR'd" with a coach like you. Peanuts- Thanks for coaching me along, even when I was a little "nutty." Babe Ruth- For your love of the game. Slim Jim- Thank you for your hard work, dedication, and love for the game. Beer glass- with a baseball inside that reads "You deserve it...."
The basket is also filled with Big League gum, Cracker Jacks, Sunflower Seeds, and cheap individually wrapped round pieces of gum that line the bottom. I used a plastic bin to hold the contents instead of a cooler. I'm still in school (do you feel bad for me)? so I made student gifts this week. I kept it simple this year. I bought the mini bags from Target. Three bags came together for $1. Can you say bargain?! I bought whistles at Target too. 12 whistles for $3. Happy Summer Parents! :) The label "You blew me away this year" is from Sparkling in Second. You can grab them for free in her store here.The bookmarks are from Brown Bag Teacher. You can grab them for free in her store here. I used my Scholastic Bonus Points to get my students each a chapter book too. Ahhh....summer. You are almost here. One more week of school for me and I'll be getting my craft on and reading up a storm. I'm hoping to make some fairy gardens this summer. Hi Julie! Thank you for linking up such cuteness on my linky!!! Those shoes!!!! So cute!!! I remember the days of not having a life....When my daughter was in high school she played travel volleyball. We traveled everywhere, all the time!!! 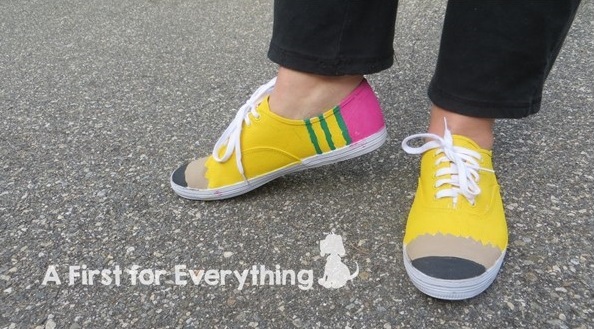 I can't even handle those pencil shoes! They are absolutely adorable. I think I need a pair of these in my life! Thanks for sharing! Those shoes!!! How fun! You nailed it... 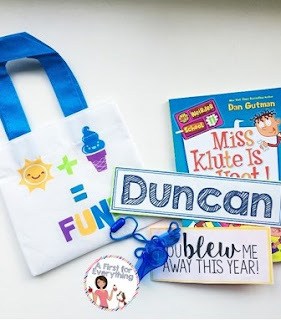 I bet your kiddos love them too! Those shoes are A-MAY-ZING! Thanks for sharing how easy they are! I LOVE the sneakers. You make it look so easy, too! (BTW, my last day of school is June 27th.). The shoes are adorable! You made it look so easy! Seriously Julie!?!? Those shoes are so cute! 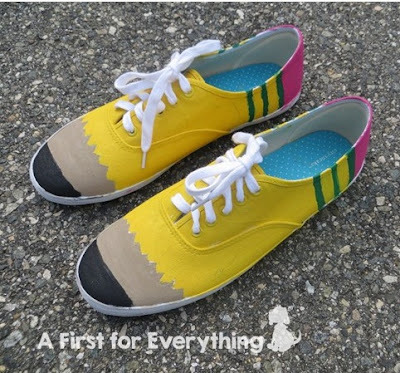 I'm going to have to make a pair! Love them!